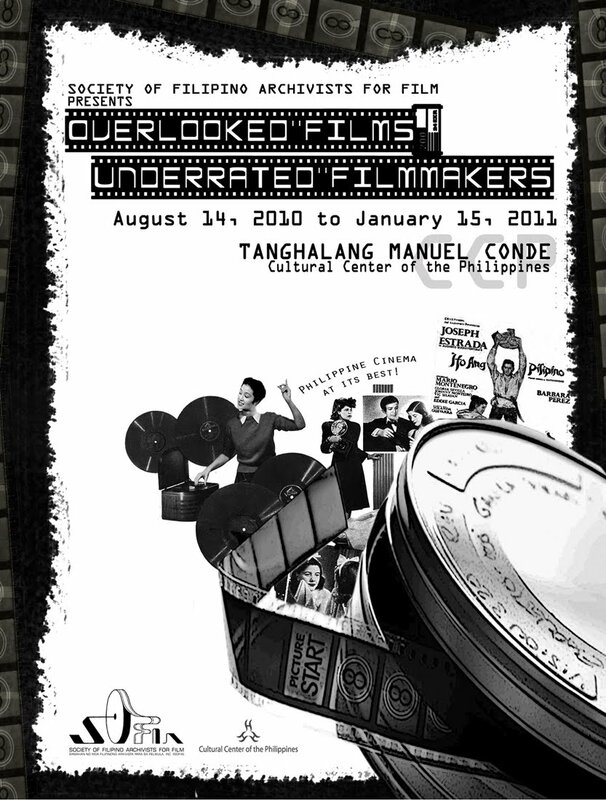 The Society of Filipino Archivists for Film (SOFIA), in cooperation with the Cultural Center of the Philippines, presents "Overlooked Films, Underrated Filmmakers" to be shown in Tanghalang Manuel Conde at Cultural Center of the Philippines from August 2010 to January 2011. I love and enjoy watching old films. I miss the good old days (1980's and 90's) when I would try to catch the black & white Tagalog films of Sampaguita Pictures, LVN Pictures and others on RPN Channel 9 when 12 o'clock noon strikes. Every year during summer, I would really watch it from Mondays to Fridays especially when I was just at home making myself busy with anything. I have a penchant of things from of old, and wish I have lived earlier, to see the world in the distant past. Philippine cinema is almost a hundred years young. In Asia, Filipino filmmakers were among the pioneers its film industry among the largest in the world in terms of output for a good number of decades. Its lively film scene remains a vibrant presence in world cinema, and a handful of it's practitioners have achieved world renown. 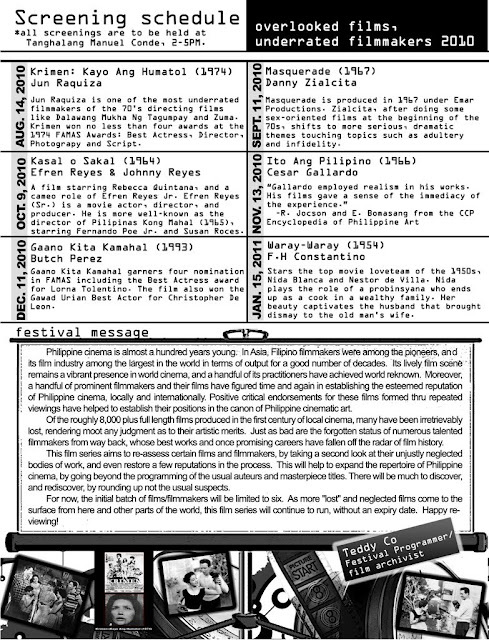 Moreover, a handful of prominent filmmakers and their films have figured time and again in establishing the esteemed reputation of Philippine cinema, localiy and internationally. 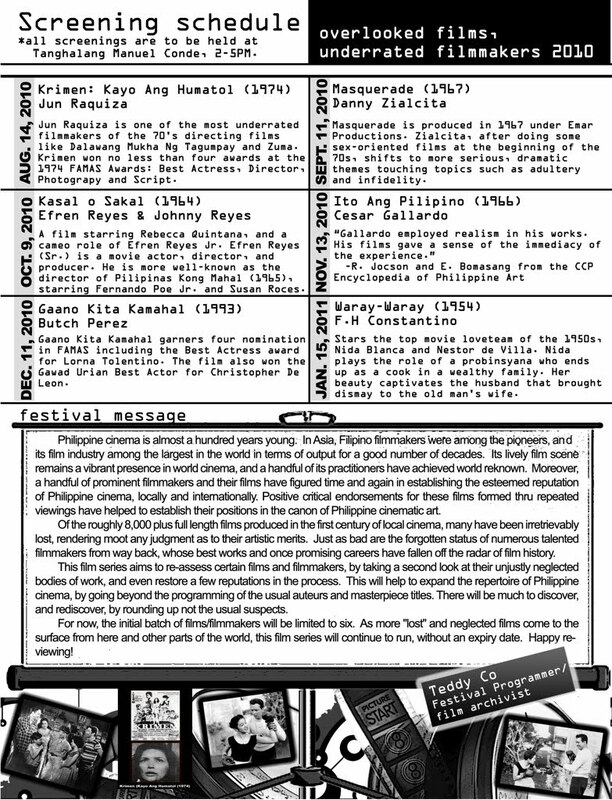 Positive critical endorsements for these films formed thru repeated viewings have helped established their positions in the canons of Philippine Cinematic art. Of the roughly 8,000 plus full-length films produced in the first century of local cinema, many have been irretrievably lost, rendering moot and judgment as to their artistic merits. Just as bad are the forgotten status of numerous talented filmmakers from way back, whose best works and once promising careers have fallen off the radar film history. This film series aims to re-assess certain films and filmmakers, by taking a second look at their unjustly neglected bodies of work, and even restore a few reputations in the process. This will help to expand the repertoire of Philippine cinema, by going beyond the programming of the usual auteurs and masterpiece titles. There will be much to discover, and rediscover, by rounding up not the usual suspects. For now, the initial batch of films/filmmakers will be limited to six. As more “lost” and neglected films come to the surface from here and other parts of the world, this film series will continue to run, without an expiry date. For more information about the organization and the films, feel free to send an email to sofiaphils@gmail.com or contact +63 920 2836393.